What Is Nexium Used For? 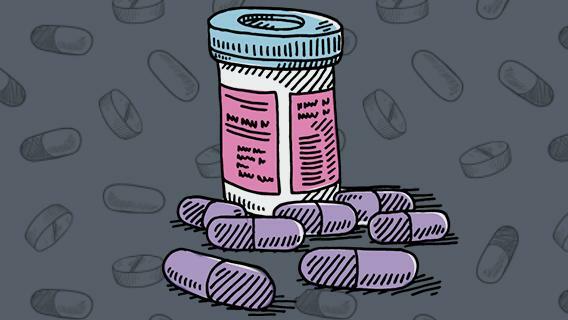 Nexium (esomeprazole) is one of the most widely prescribed drugs in the U.S. Its manufacturers heavily market it as “The Purple Pill.” Prescription versions treat serious stomach acid-related conditions. The U.S. Food and Drug Administration approved over-the-counter (OTC) Nexium to treat frequent heartburn. Studies link Nexium to serious side effects. Nexium is part of a powerful class of heartburn medicines called proton pump inhibitors. Studies link these drugs to side effects ranging from kidney damage to cancer. Nexium’s generic name is esomeprazole. It is almost chemically identical to Prilosec (omeprazole). AstraZeneca manufactures prescription versions of both Nexium and Prilosec. Prevacid and Protonix are two other related drugs. In 2018, FiercePharma ranked Nexium as the third best-selling drug in in the past 25 years. It estimated Nexium sales totaled $72.5 billion through 2017. Nexium comes in several versions. It premiered as a prescription drug. Over-the-counter (OTC), generic and store brands followed. The FDA approved the prescription version of Nexium on Feb. 20, 2001. AstraZeneca manufactures it. Teva Pharmaceuticals won FDA approval for the first generic Nexium in 2015. Its generic esomeprazole is a prescription drug. At least eight companies manufactured generic Nexium by 2018. The FDA approved the first over-the-counter Nexium in 2015. The agency approved Nexium 24HR to treat frequent heartburn. Nexium 24HR is chemically identical to prescription Nexium. Pfizer manufactures Nexium 24HR. Perrigo Company PLC won FDA approval for the first store brand version of Nexium 24HR in 2017. The over-the-counter esomeprazole features packaging for the retail outlets that sell it. It is a cheaper alternative to brand-name Nexium 24HR. People use prescription Nexium to treat serious stomach acid-related conditions. OTC Nexium treats frequent heartburn. People should not take Nexium if they are allergic to esomeprazole magnesium. They should also avoid taking Nexium if they are allergic to any of its other ingredients. People who have an allergy to any other PPI should not take Nexium. People should ask their doctor if Nexium is the best choice for their condition. Using Nexium for a long period of time may increase the risk of inflammation of the stomach lining, according to the FDA. At least one study showed long term use of Nexium and other PPIs could also increase the risk of death. The FDA warns that patients should never take Nexium 24HR for more than 14 days at a time. And they should never take more than three 14-day courses in a year. People should not take Nexium if they take certain other medicines. They should also avoid Nexium if they take certain dietary supplements. Nexium interactions can affect how one or both substances perform. People should tell their doctor what drugs and supplements they are taking before using Nexium. Patients should always speak with their doctor before stopping Nexium. Doctors may prescribe Nexium for long periods of time. Stopping suddenly can trigger a “rebound” effect. This can cause the patient’s condition to return. It can sometimes be worse than the original problem. A 2018 review in Current Gastroenterology Reports recommended ways to stop Nexium use. A doctor can work out a step-down plan. Patients can take reduced doses over a two-week to month-long schedule. Or a doctor may recommend the patient take Nexium on alternate days. Is Your Heartburn Drug Really Necessary? Patients should also talk with their doctor about possible Nexium alternatives. These may include diet and lifestyle changes. Or the doctor may recommend different medicines. For some patients, Nexium alternatives may include H4 blockers or antacids. Studies have linked Nexium and other PPIs to several long-term side effects. Not all these possible Nexium side effects show up in the medicine’s label. A 2017 study looked at 125,000 PPI users over five years. Half who developed chronic kidney damage never had kidney problems before taking PPIs. A 2016 study found long-term PPI use nearly doubled a patient’s chance of kidney failure. In 2016, researchers linked PPI use to a 21 percent increased stroke risk. They presented their findings at the American Heart Association’s Scientific Sessions 2016. A 2015 study found PPI use increased heart attack rates from 16 to 21 percent. Researchers published their findings in the journal PLOS One. A 2017 study found that PPIs may double the risk of gastric cancer in some patients. Researchers found the increased risk among people with previous Helicobacter pylori infections. They published their results in the BMJ journal Gut. A 2018 study found that PPIs taken to prevent esophageal cancer may actually cause it. Researchers in Sweden found PPIs may be responsible for five percent of all cases there. They published their results in Cancer Epidemiology. The FDA has added at least seven warnings to Nexium labels since 2010. The FDA adds warnings and precautions when evidence shows a drug may cause side effects. Nexium users should call their doctor if they have joint pain, or if they develop a rash on their cheeks or arms that gets worse in the sun. Based on animal data, Nexium may cause fetal harm. This happens with very high doses. Doctors and patients should weigh Nexium risks during pregnancy. AIN can lead to kidney failure. Kidney problems may happen at any time while taking Nexium. Symptoms to be aware of include a change in urination or sightings of blood in urine. A vitamin B12 deficiency can lead to cognitive difficulties. It may also cause memory loss. Nexium may increase the risk of developing severe diarrhea. Hospitalized patients face a higher risk. Patients should call a doctor right away if they experience certain symptoms. These include persistent watery stool, stomach pain and fever. Low magnesium levels in the blood can happen in some people who take Nexium for at least three months. Nexium users should tell their doctor about certain symptoms. These include seizures, dizziness, jitteriness, tremors, or abnormal or fast heartbeat. People taking multiple, daily Nexium doses for a year or longer may be more prone to bone fractures. The FDA cited studies reporting an increased risk of fractures of the hip, wrist and spine with PPI use. Nexium’s serious side effects are rare. But they can be life-threatening if not treated. Other side effects of Nexium are more common. In clinical trials, less than 1 percent of adults reported dyspepsia, or indigestion. Nexium lawsuits claim the medication caused kidney injuries or damage. The lawsuits are part of a multidistrict litigation (MDL) in federal court. MDLs combine several similar lawsuits. This lets cases move quickly through the legal system. As of April 2019, the MDL included 10,373 pending lawsuits over Nexium and other PPIs. People who filed Nexium lawsuits claimed the medicine caused serious kidney problems.